I am giving you all fair warning that this is just a part one. Worcester is too vast to be covered in one day of exploring, but what I can tell you after my one day there is that Worcester is full of life, vitality, art, culture and history. Most of us who live closer to the Boston side of Massachusetts think of Worcester as the home of WPI, literally the only thing I ever hear about it. I wanted to visit and learn about the city, how it started and how all the cultures converged over the many generations. Worcester is vast and is considered the most populous city in Massachusetts after Boston with a population of roughly 181,000 people. Named after Worcester, England it goes back to 1673 when John Elliot and Daniel Gookin led an expedition to Quisigamond to establish a new “Praying town”. With the many ups and downs of the area throughout the wars, including the American Revolution Worcester eventually became the center in much of what was and is happening in the Commonwealth. With the expansion of the highways Worcester became more than just Central Massachusetts and became considered part of the Greater Boston area plus with new revitalization projects Worcester’s years of economic ups and downs started being fixed. While much larger, Worcester reminded me of my current hometown Lowell. Restaurants from all over the world and iconic Worcester things like Polar Seltzer, Table Top Pie’s and George’s Coney Island Hot Dogs reminded me of our own rich history and I thoroughly enjoyed exploring as much as I could in a day.So what can I tell you about my own personal experience there? Experiencing it with two other friends- one who grew up in “The Woo” and another who lives nearby made the difference. Going in and adding my own perspective to their experiences was super cool and it encouraged me to keep writing these pieces about cities people don’t always take the time to write about. I hope you will go on this journey with me and the next time you are in the “City of Seven Hills” dig a little deeper and try something different. These Almond Joy Pancakes were delish! Right on the corner of Lois Lane and Park Ave, That’s Entertainment offers everything from records to local comic books plus a wide assortment of local snacks. There was some great street art on the outside of the building and I geeked out like a kid from the moment I walked in. If I had more time I probably would have stayed there a lot longer than I did. Also fun fact, we found a pressed copy of a Jimi Hendrix record when he performed at Clark. Aleksandra found it while digging through the treasure troves of amazing records. It was a cool thing to see. I used to read these ages ago! Love that they have a section for local creators! What’s Crompton Collective? Well its a collective of local artisans, shops, a cafe and more. It is a delicious glimpse into the beauty of local artisans in Worcester and I was so glad we managed to stop by. We went to a few of the shops and also tried the cafe and I just fell in love with it all over again ( I had previously been a couple times). So where did I go within the collective? This is a plant lovers dream. But its also way more than just plants- its home decor, the coolest vibe and a place you can get lost in for a wicked long time if you let yourself. Can I have this set up somewhere in my house? Loved each and every one of these. I love local clothing shops, and the Haberdash is one I’ve known for a while ever since my post on Hudson ( I included them in that one too!) Great looks, ranging from street style to more floral looks it has something for everyone. I loved the colors, the light coming through those great windows they have and the overall look of the place. I cannot say enough yummy things about this place. THAT BIRCHTREE TOAST THOUGH. Freshly baked bread, large open spaces for people to chill, drink and eat and a great warmth of community. The cocktail I had plus that BirchTree toast was on FIRE. A collection of antiques, locally made wares and just a FUN Worcester vibe. If you like to support local this entire place is worth your visit. This is my 3rd time here and I never get tired of it. Definitely a must visit so don’t forget to go to the bottom floor and check them out. 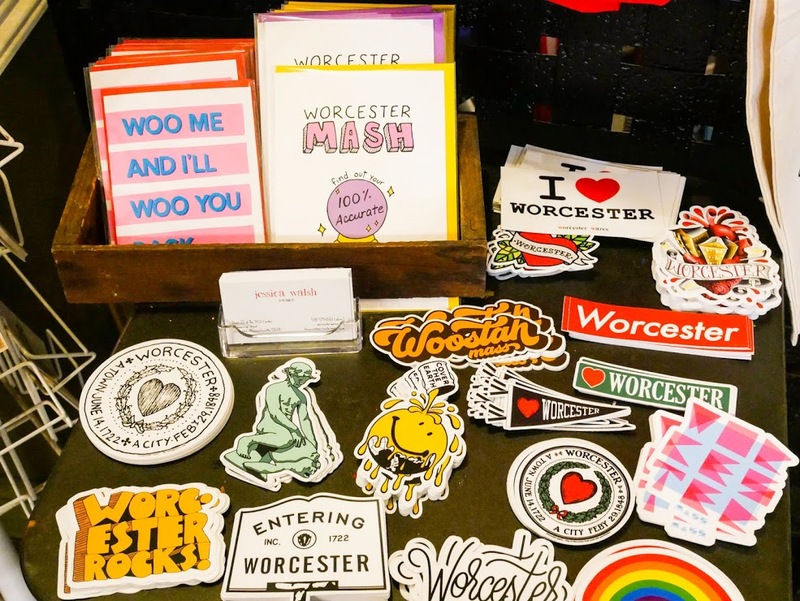 Get all your Worcester gear here and support local! There was nothing average about this pizza. Done in an extremely thin style and shaped into 14 inch squares, these pizzas satisfy your cravings for delicious combinations and flavors. From unique flavors like Chicken Caesar pizza to a more traditional Tomato Basil pizza Corner Grille fulfills all the different tastes. Plus as a local institution for a little over 20 years they have managed to keep people happy by doing what they do best, creating great Pizza pies in a cool little shop. Also the house made teas and lemonades? To die for! 14 Inch Flatbread pizzas were delicious. We tried 5 different ones. Anytime I find a museum I try to visit and the Worcester Art Museum or WAM was calling my name so I had to go! First of all I loved the murals when you first walk in, those women were super cool. They currently have an incredible Monet exhibit plus a personal fave ( which I almost didn’t see) was the Travels with Hiroshige exhibit. Its a beautiful museum, with art and feeling in each crevice you look at. Really enjoyed my time there and huge thank you to Sondria who pulled me into the Hiroshige exhibit before we left. We went through so many different rooms with all sorts of Art. Such a variety! This place is iconic, enough for me to actually eat hot dogs. I haven’t had a hot dog probably in a couple years by now but I loved reading about this place and knew I just had to go and include it on this list. While the actual location has been there since 1918, it became what it is today in 1929. From the juke box to the original chair to the booths with thousands of names scratched into them it has a nostalgic appeal I completely understood the second I walked in. Go for the hot dogs leave with a smile. I have had an obsession with Brazillian food lately and wanted to try Salgabom after I found them doing research online. Located on Shrewsbury St. in Worcester ( a long, long road of restaurants and other fun stuff) they are had to miss with their brightly colored sign in the little plaza they are situated in. We ordered the X-Tudo Burger and the Churros. I of course bought a Guarana soda- even though I had never tried it before but after reading the description on the back I was sold. OMG THOSE FRIES THOUGH. Amazing. A friendly smile to greet you. Murals, murals and more murals. If I could find every mural I would be happy, but as many as I could I took photos of them. Every piece was unique, each one different and perhaps showcasing a bit of the city through the artists eyes. I make a point as I have said before to check out the street art in each new place I visit. Over the years its been popping up more and more and I just love that. Art is a form of expression and we all do it so differently. Worcester was no different, from full on murals to little art pieces it just opened my eyes up to the colorful nature of “Woo-Town”. Such a fun mural, I pulled over wicked quick when I saw it. Both of these are in the Worcester Museum of art, but I included them here because of sheer size! I had many other places on my list, but it was just too much for one day. I will be doing a part two on Worcester at some point later on this year and hopefully can finally go deeper into a little more of their cuisine, the culture, the arts. I hope you enjoyed my visit and adventures through the “Heart of the Commonwealth” and hope you will continue following along on my adventures throughout this year. *Want to know every time I post a new blog post? Subscribe to my blog. You will only get an email when I post! Such an epic post! Love, love, love the pics! Oh thank you! Thank you for coming on this adventure with the Maven!!! Hi Barbara! Thank you so much for stopping by, I am so glad you enjoyed the post! It’s people like you who keep me going and constantly showing my followers all my adventures. Love the bumper stickers! Where can I find them? Hi! They are at Crompton collective!